Relais & Châteaux Grand Chef Christopher Brooks of The Dining Room at Blantyre in Lenox, Massachusetts in the Berkshires graciously shares his recipes for Cucumber Panna Cotta; New England Cod with Zucchini Cake and Romesco; and Peach and Raspberry Salad. Once a former Gilded Age mansion, Blantyre is a stunning luxury hotel with 19 rooms and suites, and has an award-winning fine dining restaurant featuring exceptional country house cuisine. Chef Christopher Brooks is a passionate chef who takes a hands-on approach to what he calls country house cuisine, which includes making his own bacon, and smoking salmon on the premises of Blantyre. He honed his culinary skills in his native England, was trained in classic French techniques, and worked at top restaurants in England and in the United States before joining Blantyre in 2000. 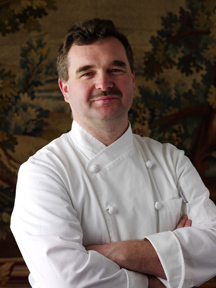 In 2008, he received the prestigious distinction of Relais & Châteaux Grand Chef, which he said was a great honor. 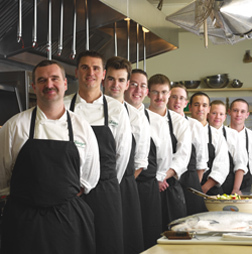 I had the opportunity to get to know Chef Brooks and his cuisine twice, once in November 2009 after a lovely lunch, and again in late June 2010, when I spent a weekend at Blantyre where I experienced his Five Course Surprise Tasting Menus, as well as his incredible breakfasts. For a chef, it is important to be able to obtain the best ingredients, and being located in the culinary heart of The Berkshires with its nearby dairy farms, local cheese producers, produce farms, and New England fish, is a dream. What he most enjoys is the ability to be able to cook with the distinct four seasons of the region. When not in the kitchen, this talented chef who is a 12-handicap golfer can be found playing an early morning round on the golf course, driving his vintage 1972 Austin Mini Cooper, hanging out with his son, traveling, or enjoying food whether it is a simple sandwich or a fine dining experience. His recipes are featured in the new book, The World of Blantyre & The Cookery of Christopher Brooks written by Claire Hopley, which you may read about in the Luxury Products / Gifts section. Chef Christopher Brooks provides a delicious taste of Blantyre with his recipes for Cucumber Panna Cotta; New England Cod with Zucchini Cake and Romesco; and Peach and Raspberry Salad. Bon Appétit! Method: Put the gelatin in a cup or small bowl and stir in the hot water, stirring until the mixture looks clear rather than grainy. Then set the cup in a dish and pour hot water into the dish to surround the cup and keep the liquid warm. Should the gelatin show signs of setting, simply reheat it until it is liquid again. Lightly grease the 8 cups with butter. Set aside. Melt the 1-tablespoon butter in a medium saucepan over low heat. Stir in the shallot and the diced cucumber. Season with a little salt, stir, cover and sweat over low heat for 8 to 10 minutes or until the cucumber has softened somewhat. Add the vinegar and wine to the saucepan and let it simmer to reduce it a little. Now add the spinach, cook for another minute and then tip the contents of the pan into a blender or food processor and process it. While still warm, add the dissolved gelatin and the raw peeled cucumber and process again. Add the lemon zest and season to taste with lemon juice. Strain the mixture through a sieve into a bowl. Do not force any solids through the sieve. Thoroughly stir in the sour cream. Taste for seasoning and adjust to your taste with more lemon juice, salt and pepper. While the mixture is still liquid, pour it into the prepared cups. Put in the refrigerator or other cool place for about 4 hours or until set. To unmold, run a thin knife blade between the panna cotta and the ramekin or cup. Invert each onto a serving plate and give a sharp shake to release the panna cotta. Serve with thin slices of cucumber and thinly sliced smoked salmon. Chef Brooks both pickles salmon to produce salmon pastrami, and smokes salmon in-house, using his own combination of ingredients and methods. Method for the Romesco: Heat the olive oil in a heavy-bottomed saucepan over medium heat. Add the red pepper, tomato, shallot, tomato paste, saffron, basil, parsley and thyme. Stir, cover the pan, lower the heat and let the vegetables gently sweat for about 5 minutes or until softened. Stir once or twice more. Add the water and simmer until the peppers are soft. If the mixture begins to dry out, add a little more water. Puree and cool. The mixture should be thick when cool. Method for the Zucchini Cake: Preheat the oven to 375° F (191° C) and lightly grease the side of a non-stick 8-inch (20 cm) layer cake pan or a dish of similar size. Lay in 2 sheets of parchment paper cut to fit the bottom. Grate the zucchini on the large holes of a cheese grater. Put the grated zucchini in a bowl along with the basil. Stir in the cornstarch and the egg and season to taste with salt and pepper. Put the mixture in the prepared cake pan and smooth the surface. Bake for 7 minutes and take out of the oven. Remove the cake from the pan by placing a dinner plate over the pan. Holding the pan and dinner plate together, invert the pan so the zucchini cake falls onto the plate. Remove the parchment paper from the zucchini cake. Slide the zucchini cake back onto the second sheet of parchment paper in the pan and bake for another 7 minutes. Method for the Cod: While the zucchini cake is in the oven, season the cod with salt. Heat the olive oil in a nonstick pan and sauté the cod for 4 to 5 minutes on each side. To serve: Cut the zucchini cake into 6 pieces and place a cod steak on top of each piece. 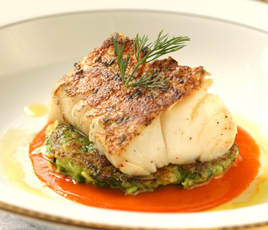 Spoon the room temperature romesco on the cod. Chef recommends a Caesar salad or a salad of baby greens with this dish. Method: In a small saucepan, bring the port wine and sugar to a boil, stirring to dissolve the sugar. Let this syrup cool for 10 minutes. Halve the peaches and then cut each half into 4 slices. Pour the port syrup over the peaches. Add the raspberries and mint. Leave the mixture in the refrigerator overnight. 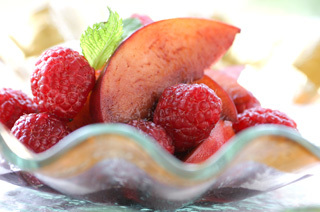 This looks rich and lovely served in wine glasses or goblets with a tiny scoop of orange sorbet. Wine Note: For a wine as refreshing as the dessert, try a light Italian Moscato d'Asti. 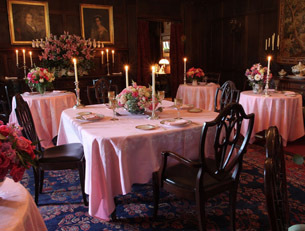 The Dining Room at Blantyre is open for lunch for outside guests Wednesday through Sunday from 12:30 pm until 1:45 pm, and for dinner for outside guests from Wednesday through Sunday from 5:45 pm until 7:45 pm. The restaurant is open for hotel guests daily with extended hours for dining. Read about Blantyre in the Destinations, Hotels and Resorts, Restaurants, Spas, and Luxury Products / Gifts sections. Read other articles on The Berkshires in the Destinations, Hotels and Resorts, Restaurants, Chefs' Recipes, Spas, and Arts sections. For more information on The Berkshires, please visit the Berkshire Visitors Bureau website: www.Berkshires.org. 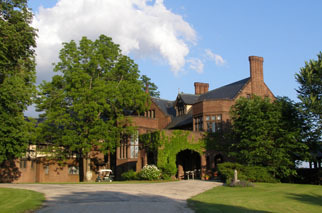 For more information on Massachusetts, please visit the website: www.MassVacation.com. © January 2010. Luxury Experience. www.LuxuryExperience.com All rights reserved.